Luxury homebuilder Florida Lifestyle Homes has completed the Casa Kam model at Quail West Golf & Country Club in North Naples. An open great room floor plan, the Casa Kam is a four-bedroom home with four full baths and one half bath in 3,538 square feet of air-conditioned living area. With the outdoor living area, three-car garage and covered entry, the Casa Kam incorporates 5,984 total square feet. The Casa Kam is priced at $1.39 million. Located on a golf course home site, the Casa Kam is designed with spaces that flow seamlessly from indoor to outdoor living areas. A wall of glass with two pocketing doors opens the great room to the lanai, creating a perfect setting for entertaining. The great room ceiling is accented with a unique beamed treatment. The covered lanai provides a golf course view and includes a full outdoor kitchen, dining space, an outdoor living area and pool, inviting family and guests to take full advantage of the Florida lifestyle. The custom pool is designed with a shallow sunning deck and a spa with a spillover into the pool. A water feature with multiple fountains borders the pool. The Casa Kam features an island kitchen with a walk-in pantry. The adjacent dining room overlooks the pool and opens directly to the lanai through triple pocketing glass doors. There is a study at the front of the home and a utility room with access to the garage. A private and serene retreat, the master suite occupies one wing of the home. Entered from the great room through double doors, the coffered-ceiling bedroom also opens to the lanai and pool area through pocketing sliding glass doors. The centerpiece of the master bath is a soaking tub set in front of the walk-through shower. There are two vanities, a private water closet and two generous walk-in closets. All three of the guest suites include a private bath. The fourth bedroom also has direct access to the pool and lanai. The bath in this bedroom doubles as a pool bath. Quail West is an 1,180-acre golf course community. The centerpiece of social life in the community is the 70,000-square-foot Grand Clubhouse with fitness facility, solarium pool, tennis center and spa. Quail West boasts two Arthur Hills-designed championship courses with an active calendar of tournaments and events. Founded in 1993 by Bill Ennen, Florida Lifestyle Homes Inc. is at 14311 Metropolis Avenue, Suite 101, Fort Myers. Florida Lifestyle Homes, Inc. is a preferred builder in Quail West, Naples Reserve and Treviso Bay in Naples, West Bay Beach & Golf Club in Estero, Cape Harbour in Cape Coral and Babcock Ranch in Charlotte County. 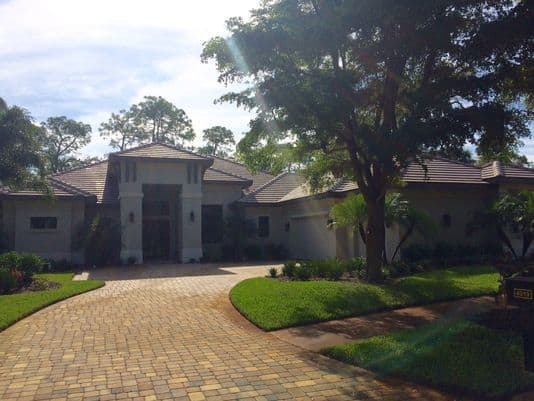 The company also has large estate home sites available in the private boating riverfront community of Caloosa Preserve and builds custom homes on owners’ lots throughout Southwest Florida.